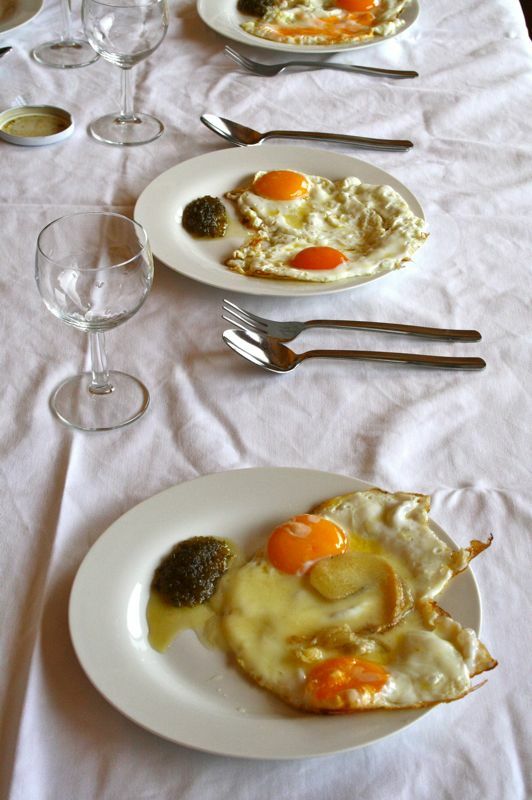 In Spain, eggs are hardly ever going to be the first thing you eat in the morning. But that doesn’t mean they’re not popular– on the contrary! 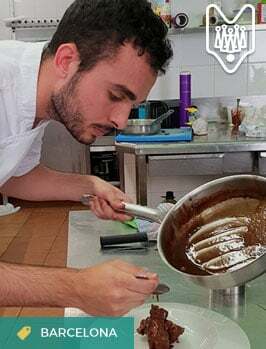 They are the star ingredient of many traditional Spanish tapas like tortilla española and also the go-to garnish for everything from salads to salmorejo. 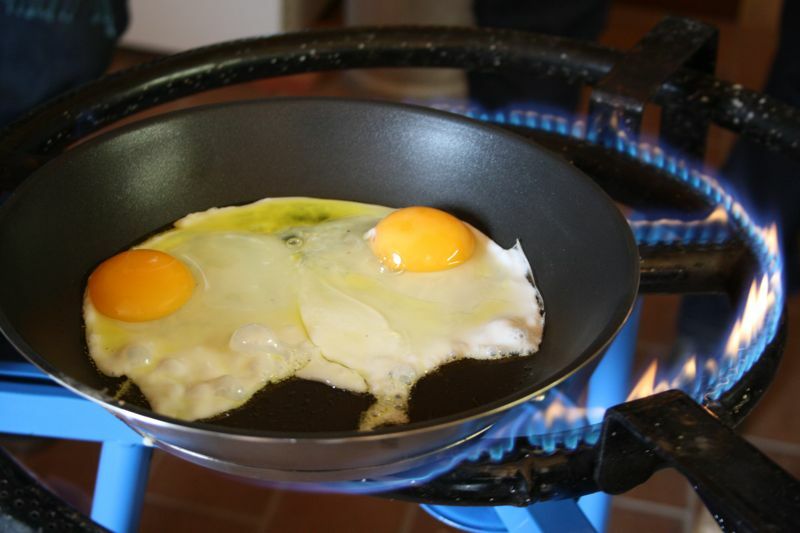 In fact, eggs are so popular here that the average Spaniard eats more than 10 dozen eggs per year! 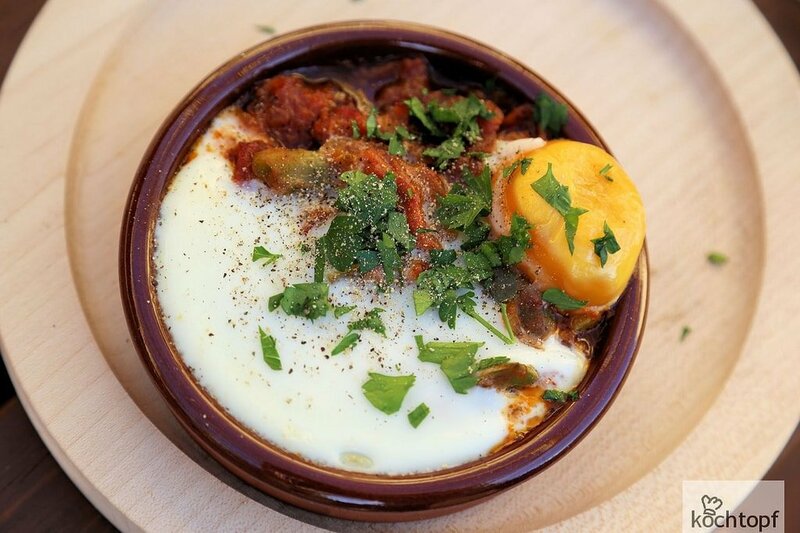 No matter how you like your eggs, there is sure to be a Spanish egg dish that suits your fancy. Here are 14 of our favorites. If you only try one Spanish egg dish, make it this one. Tortilla de patatas (often called tortilla española) is easily one the most popular dishes (egg-based or otherwise) in the entire country. 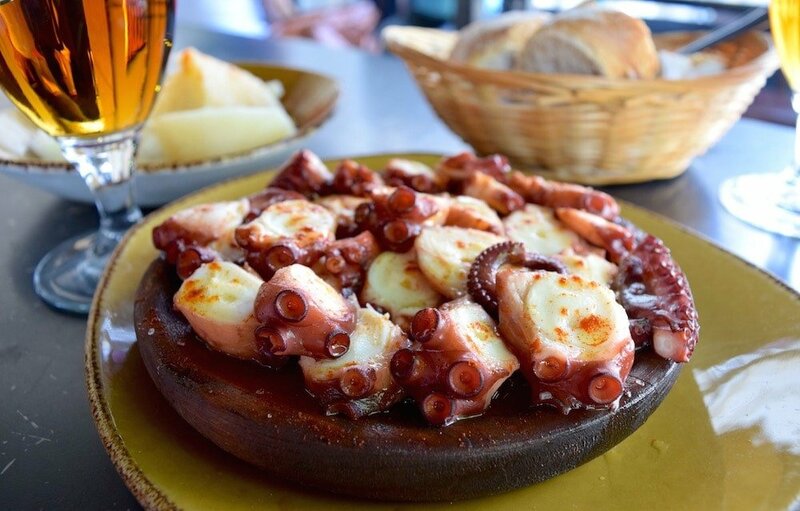 It’s arguably the national dish (that’s right– it’s NOT paella!). Every chef has their own special tortilla trick, making every tortilla you try unique. While the most basic Spanish omelets are made from a mere 3 ingredients (eggs, fried potatoes and salt), many people also add fried or caramelized onions. While huevos roto vary greatly from region to region, the basic concept is always the same: olive oil fried eggs with runny yolks laid atop fried potatoes. The name comes from the moment after the dish is served when either the waiter or the diner breaks the egg yolks with a fork or knife, allowing the yolk to run over the potatoes. Sometimes the dish is called huevos estrellados. 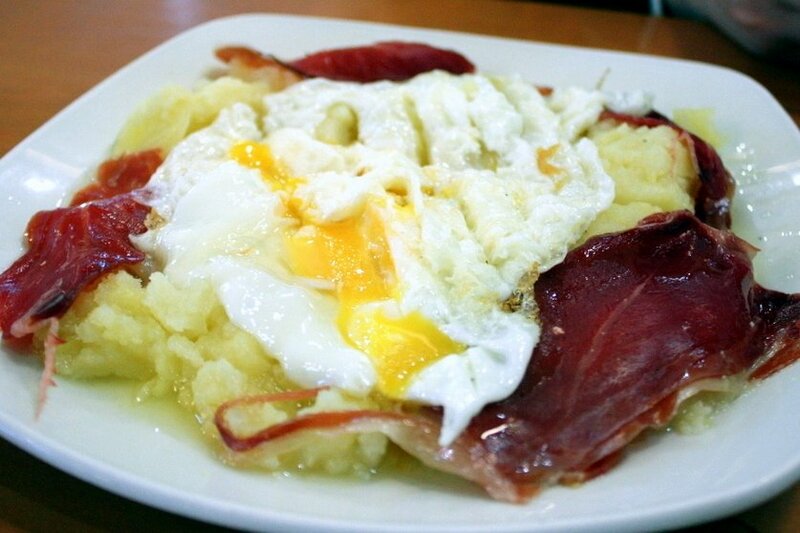 Along with the gooey goodness of the egg yolk, the potatoes are also often accompanied by either cured ham or sausage. Some of the most popular toppings for huevos rotos are slices of chorizo or chunks of mini-chorizo-like sausages called chistorra. 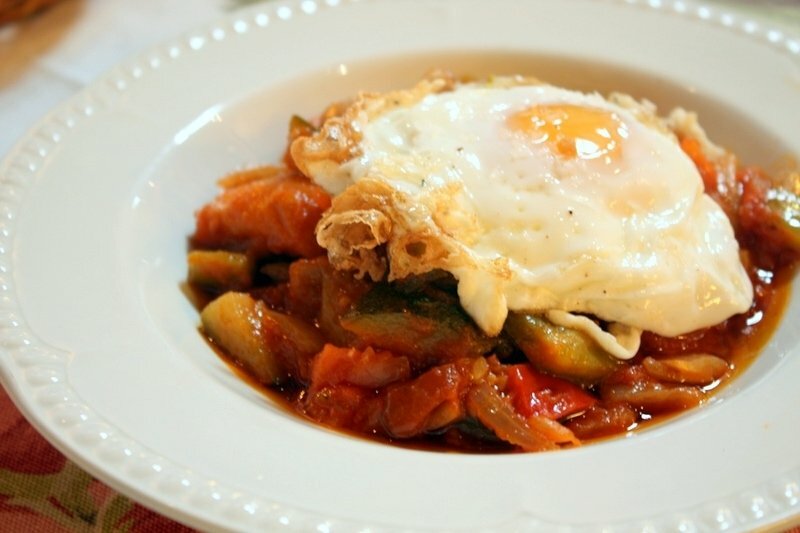 One of my favorite Spanish dishes: pisto con huevo. Zucchini, tomato, onion, potato and bell pepper are stewed together to create a rich, slightly sweet pisto. That ratatouille-like stew is then poured into a piping-hot clay bowl and topped with a sunny-side up fried egg. Much like with huevos rotos my favorite part of eating pisto con huevo is slicing the perfectly placed fried egg in two, freeing the flavorful yolk. 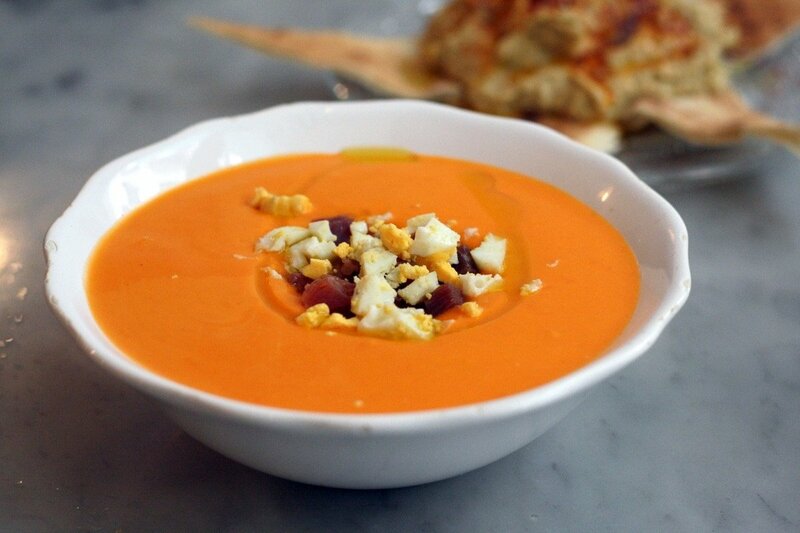 Don’t forget to grab a piece of bread to sop up the scrumptious juice left at the bottom of the bowl! Delicious and beautiful huevos rellenos. 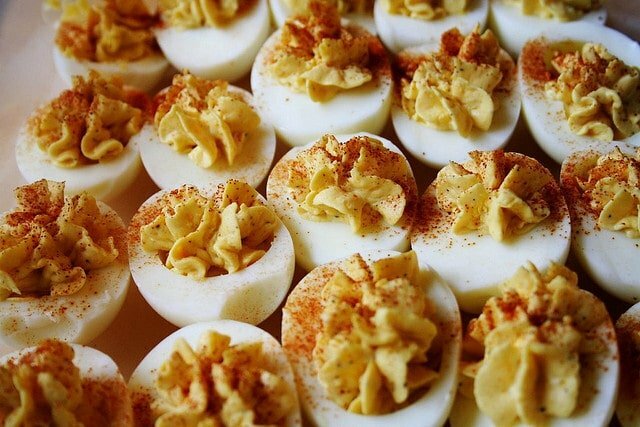 Spanish deviled eggs usually involve some type of seafood, and are often made using canned tuna, tomato paste, mayonnaise and a light sprinkling of paprika. Cheese and fried eggs? Yes, please! Fried eggs are both a popular topping to many dishes and an all-star plate of their own. 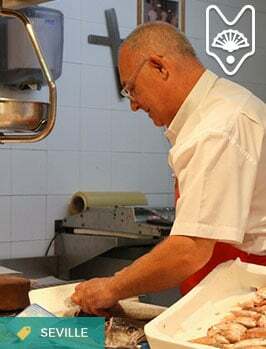 Whether it is from a chicken, quail or goose (all of which are popular in Spain), eggs here are traditionally pan fried in olive oil on only one side. The yolks are always runny and the whites are often rimmed with a crunchy fried edge. A “French omelet,” as it is called in Spanish, is a thin layer of scrambled egg often folded in thirds. It is eaten by itself or with a quick sprinkling of salt. A revuelto with young garlic. A revuelto is another Spanish egg dish that is ripe with possibilities. Revueltos are always served with one or two other ingredients mixed in. 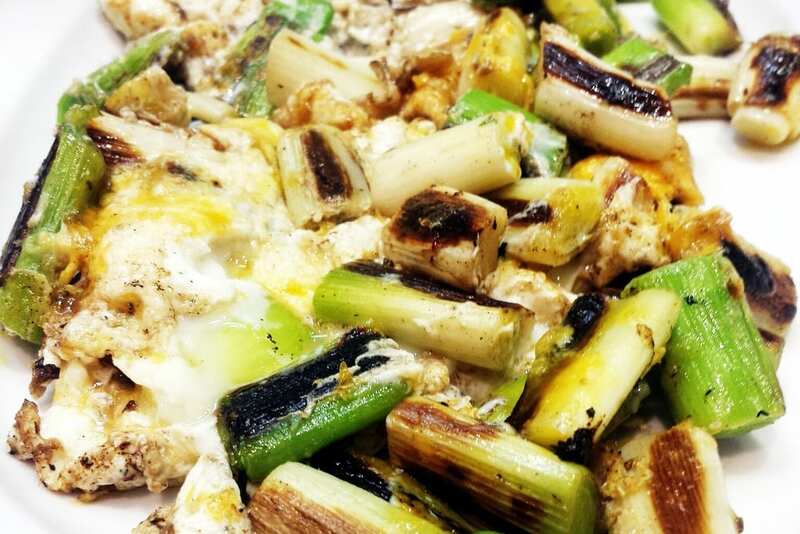 Some of the most popular scrambled egg add-ins are blood sausage, asparagus, cod fish or garlic stalks. Hard boiled egg may be a quintessential breakfast food in much of the world, but in Spain it is often relegated to a garnish. You’ll most commonly find huevo duro cubed atop a cold tomato soup called salmorejo or sliced onto lettuce and tomato to make a classic Spanish salad. Strings of fried potato create a nest for a poached egg in this visually creative and downright delicious dish. 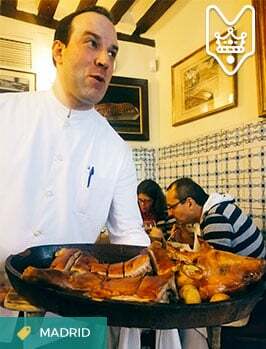 Watch Spain’s go-to TV chef Karlos Arguiñano make them here. 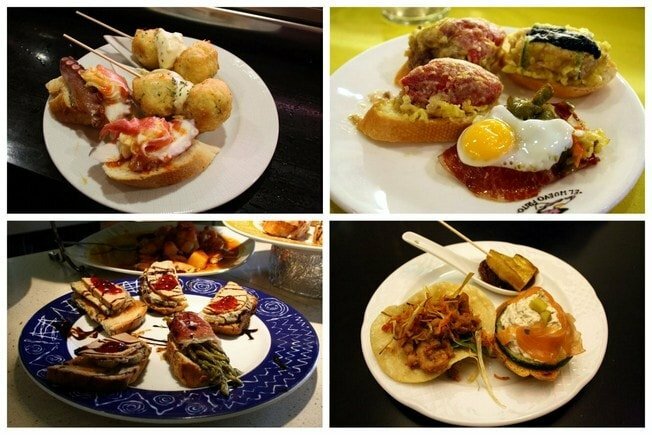 Pintxos in Bilbao– can you spot the quail egg? Quail eggs are the tapas-sized sister of the traditional chicken egg. It is common to find these mini-eggs pan-fried and sitting atop small slices of bread piled with grilled peppers, mushrooms or any number of cured meats or fish. 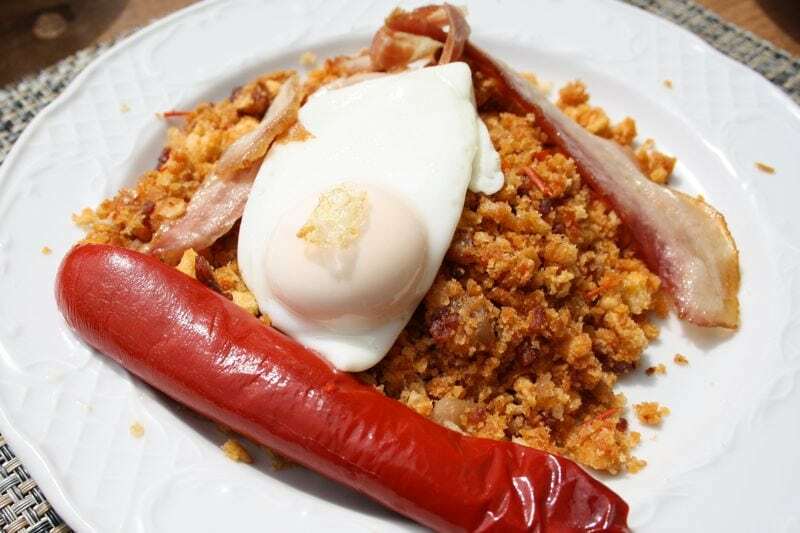 Migas in Extremadura served here with a delicious roasted pepper. Migas are Spain’s answer to stuffing. They are made from chunks of day-old bread that has been rehydrated with salt water and pan fried with sweet green peppers, onion, garlic and fatty bacon. They are commonly topped with fried eggs and any number of other items such as chorizo or even green grapes! Mmm, savory huevos a la flamenca! When I think of the perfect brunch food, I think of huevos a la flamenca. 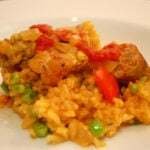 In this classic dish, tomato, peas, bell pepper, potatoes, chorizo, ham and onion are topped with eggs and baked until the egg whites are cooked but the yolk remains runny. The only downside is I have to wait until dinner to devour it. Huevos al Plato are the simple version huevos a la flamenca. Instead of vegetables, this skillet-like dish lets the meat be the star. Huevos al plato typically include one or two types of cured sausage or ham. Watch how the goodness is made here. 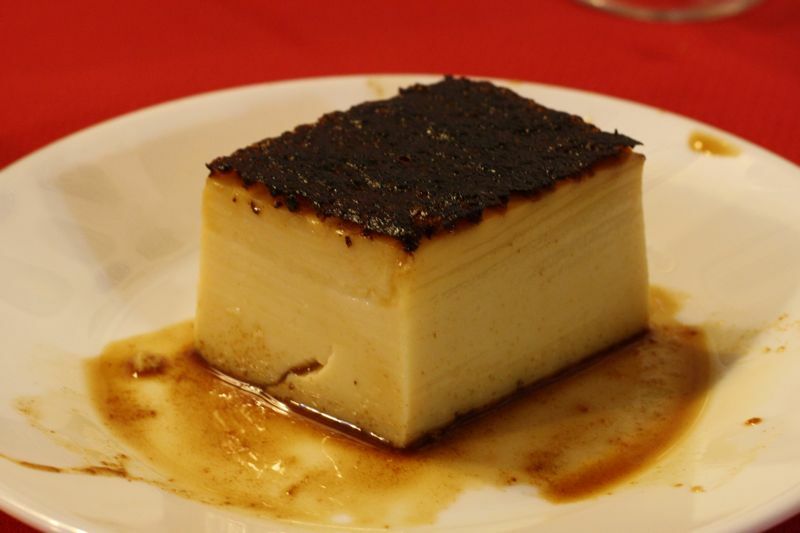 Delicious flan de huevo for dessert! What better Spanish egg dish to end with than a sweet one. This sweet, vanilla egg dessert is served cold and is a staple of most dessert menus. What is your favorite Spanish egg dish? I have seen a tortilla de patatas on a breakfast buffet. That is the ONLY way I will eat eggs! And the tortilla must not be runny! That’s just how I like it. I think I might eat more than 10 dozen eggs per year! 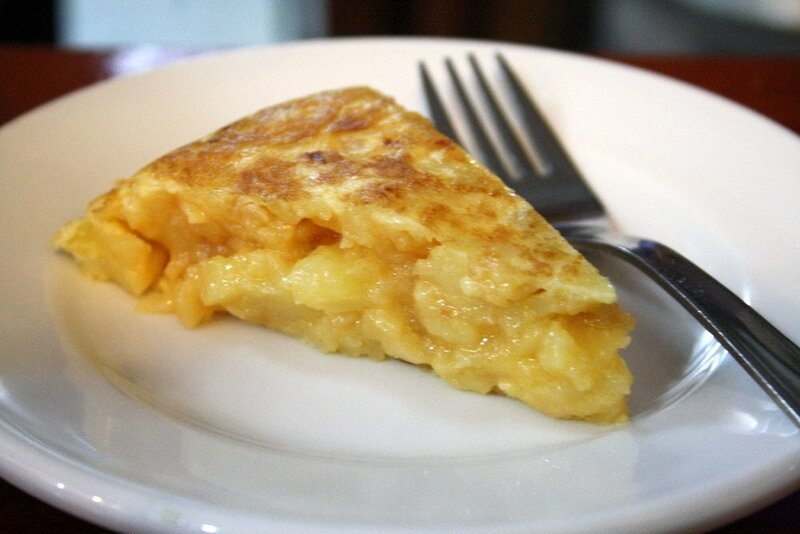 A friend who is the MASTER of the art of Spanish tortilla makes his with a dozen eggs. YES! A dozen. We usually make ours at home with 6-8. It’s not as good as his. Maybe that’s why! 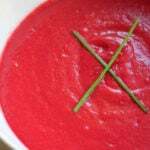 What about Sopa Castellana? Or, Huevos duros con béchamel? Huevos Rotos = I add chorizo and bacon. Smother it with salsa is the best! I found this site by accident and thought I would write with my question. We recently came back from Barcelona, Spain and ate at Flauta-II. They served a dish called Crazy Eggs. We all loved it and tried to find the recipe. It was eggs over shoestring potatoes. I thought it tasted a little spicy and am not too sure how they did this. Any help you can give will be appreciated. Thanks. Hmm, I’ve never heard of this, although eggs over potatoes is a Spanish staple! Perhaps the spice was a bit of hot paprika? That would be traditional! Thank you for all these great recipes! Very well written. I’m getting ready to cook up a storm while watching the Vuelta. I’m obsessed with eggs & potatoes. Already did the Tortilla de Patata. 5-STAR YUM!!! Mr. Picky liked it a lot too. In Berkeley, Spanish brunch has become pretty trendy! My favorite dish is patatas bravas “poutine” with confit pork and fried egg on top. What do you think, is that just sacrilege? I don’t do runny eggs. Everything looks do-able for my ‘silly under developed’ American’ taste but I love all the ingredients! Just need my eggs to never be runny or I’ll lose it bad….